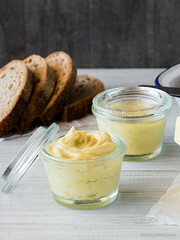 Butter and I have a long history — or perhaps a lack there of… Many decades ago there was a cheeky toddler habit of biting into sticks of butter (and onions apparently), but that quickly passed and turned into years of simply not using butter because it was just tasteless fat spread over toast and what was the point? 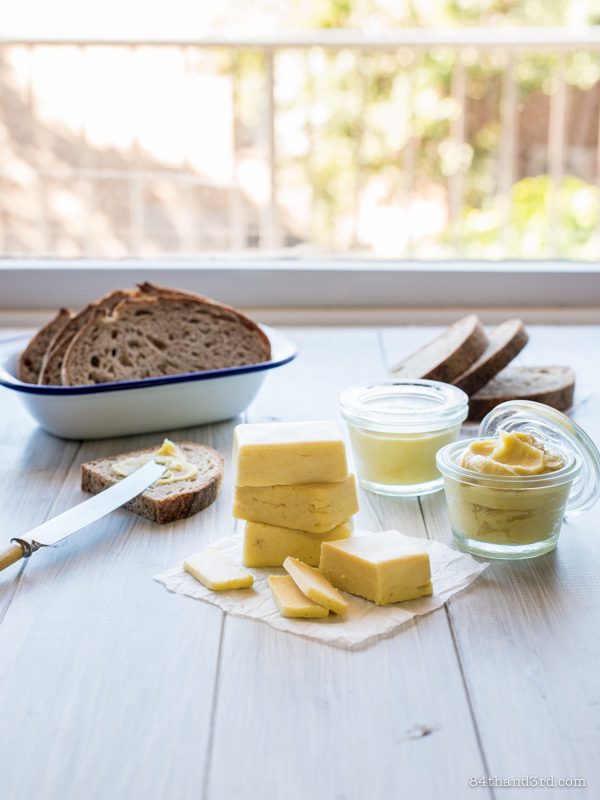 Then more recently there was the discovery of local hand-made cultured butter. 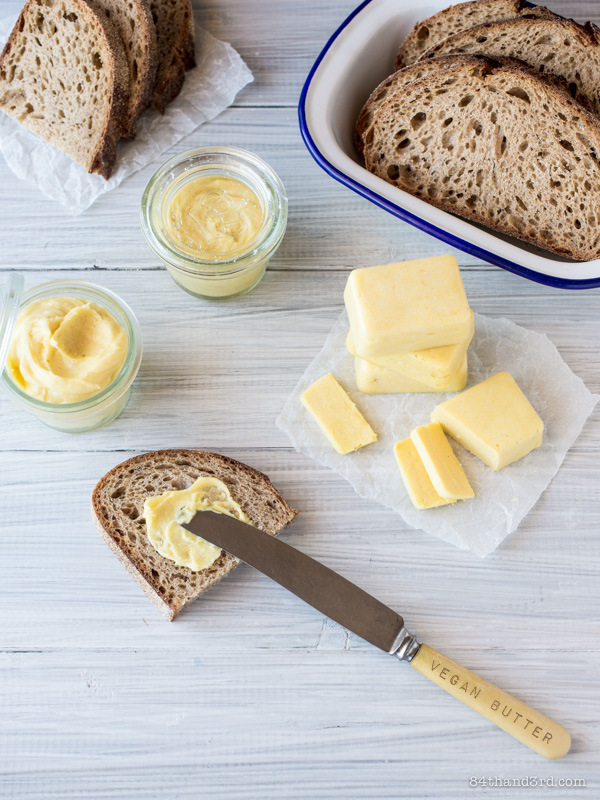 Packed with flavour and spiked with crystals of sea salt it changed my mind about humble churned cream — but a new found love of butter was completely at odds with trying to remove dairy from my diet. 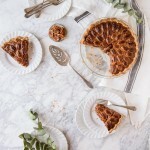 Now let me make something abundantly clear — this is not a post about the pros and cons of dairy or butter or coconut oil or saturated fat or ethics or anything other than a gorgeous spread loaded with little other than B-vitamins and medium-chain fatty acids and umami-like taste sensations. 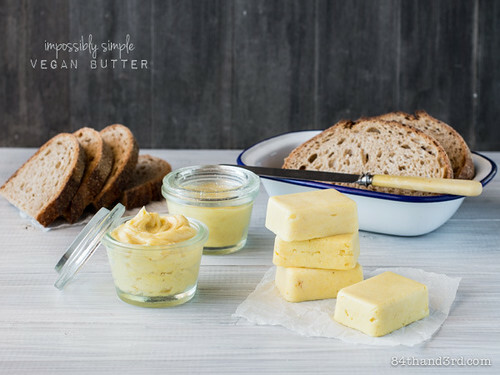 So how did this impossibly simple, four ingredient, vegan butter come to be? Good old fashion slightly mad-science kitchen experimentation of course. One plus one suddenly equaled three and before I knew it magic was happening in the form of Vegan Butter. 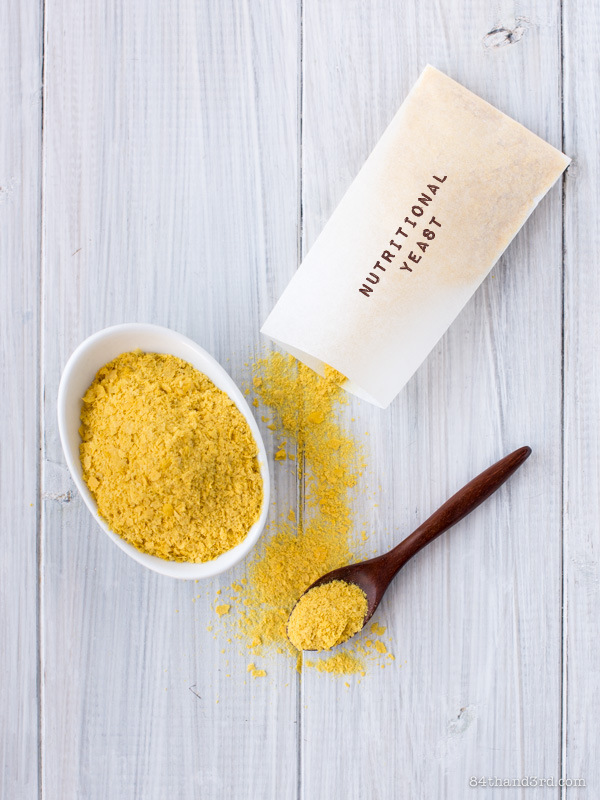 Nutritional Yeast is a naturally occurring yeast which is cultured in a controlled environment by growing Saccharomyces Cerevisiae on molasses or sugar cane¹. It’s then deactivated and dried, rendering the yellow flakes or powders you can buy in any health food store. So what’s the draw? 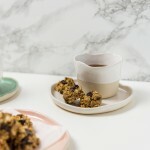 Well, for starters it’s packed with vitamins and minerals including Thiamin, Riboflavin, Niacin, B6, B12, Folate and even Protein and amino acids². Sometimes labeled as Savoury Yeast Flakes, Nutritional Yeast dissolves easily in water and gives a savoury, cheesy flavour to many vegan and vegetarian recipes. However what Nutritional Yeast IS NOT is almost as important as what it is… Nutritional Yeast isn’t the stuff that makes bread rise or what you use for brewing beer, it doesn’t promote growth of Candida, it doesn’t contain gluten, dairy, soy, sugar or anything from an animal. Straight-up it is an acquired taste, similar to stock powder but without the salt, however as a key ingredient of sauces or dressings or vegan butter it is brilliant. It’s worth noting that even the tiniest bit of salt completely transforms the flavour. When you buy Nutritional Yeast check the ingredients to make sure it doesn’t have any added whey (milk) or gluten products. I’m not paleo. I understand the concept and have a fair few recipes that happen to fit with Paleo principals but don’t live it. As such I’ve pulled together a few Paleo-passionate opinions covering this topic. General consensus seems to be “yes, Nutritional Yeast is Paleo” but have a look and decide for yourself. 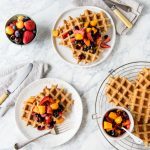 The Paleo Mom, when evaluating if foods are Paleo, asks “what effect does this specific food have on our digestion, the integrity of our gut, hormone balance, and inflammation?” As Nutritional Yeast has a positive impact on these questions she gives it at tick of approval. 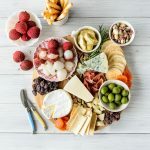 Irena from Eat Drink Paleo has defined Nutritional Yeast as neutral when it comes to the question “Is it Paleo?” and has used it for a Paleo Cheese Sauce. Does Vegan Butter melt like regular butter? Make sure your label says “Extra Virgin”, “Cold Pressed”, “Unrefined” or “Raw” — or even a combination of all of the above. You DO NOT want anything listed as “Hydrogenated” or “Partially Hydrogenated”. I also avoid anything labelled “Refined” as it removes most of the goodness to enable cooking at high temps with the oil. Different brands have different flavours, find one you like. I’ve been using Coconut Oil for a while now and don’t actually get any coconut flavour from it anymore. This one out of the US is what I use for straight eating and raw recipes, I get it at Harris Farm of all places. I have a big jar of this one for baking and cooking. How do you make the pretty little blocks? I have a slightly dishevelled plastic form from a packet of frozen dumplings (yes, really), however if you want to be more professional there are a few great silicon moulds that would be perfect. Is this that vegan butter recipe with the chemistry and curdling and soy? No. Is it based on that one? Nope, not even slightly. 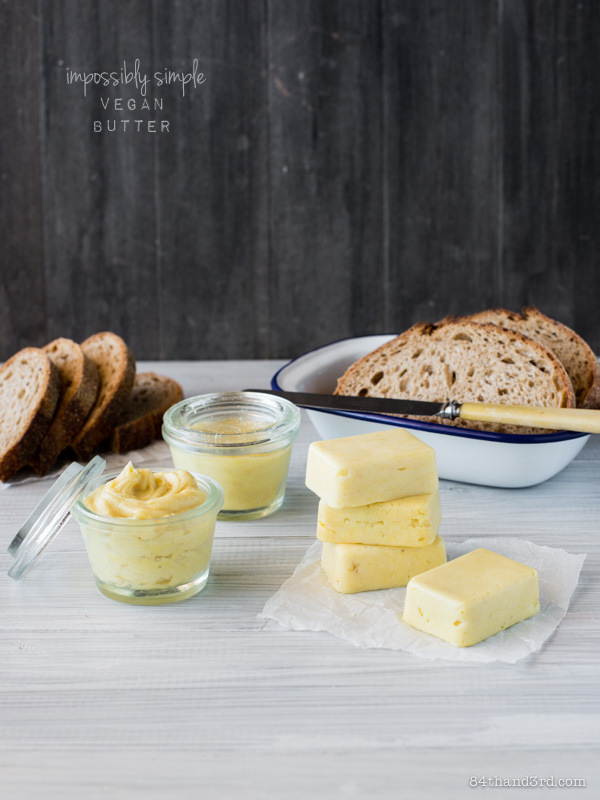 A butter fix without dairy or soy or corn or funky hydrogenated oils, simple as that. 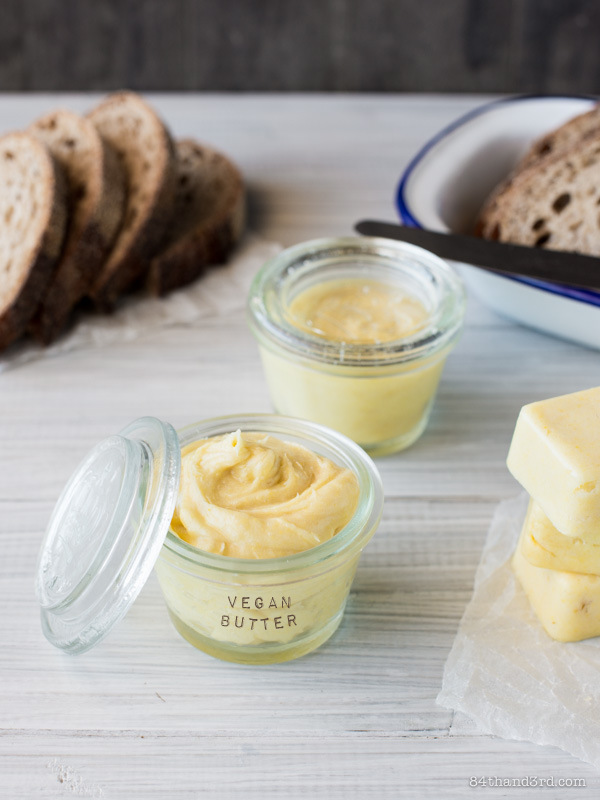 Vegan butter is perfect for spreading on hot toast, but before you know it you’ll be stirring it through pasta, using it to saute mushrooms and finding pretty much any other excuse to use it. Beat coconut oil until smooth and satiny. Dissolve yeast flakes in the water, stir in half the salt. Beat yeast paste into coconut oil and add remaining salt to taste. Store in refrigerator. Whip coconut oil with a hand mixer or the whisk attachment of an immersion blender for one minute — you want it to be smooth and a bit fluffy. In a small dish dissolve the yeast flakes in the water, stirring well to create a thick paste, then stir in half the salt. Scrape yeast mixture into the coconut oil and beat for another minute until well incorporated. You can add less of the yeast paste for a milder flavour, or make up a bit extra for a stronger one. Add remaining salt to taste. Spoon into moulds or container of choice and store in refrigerator. 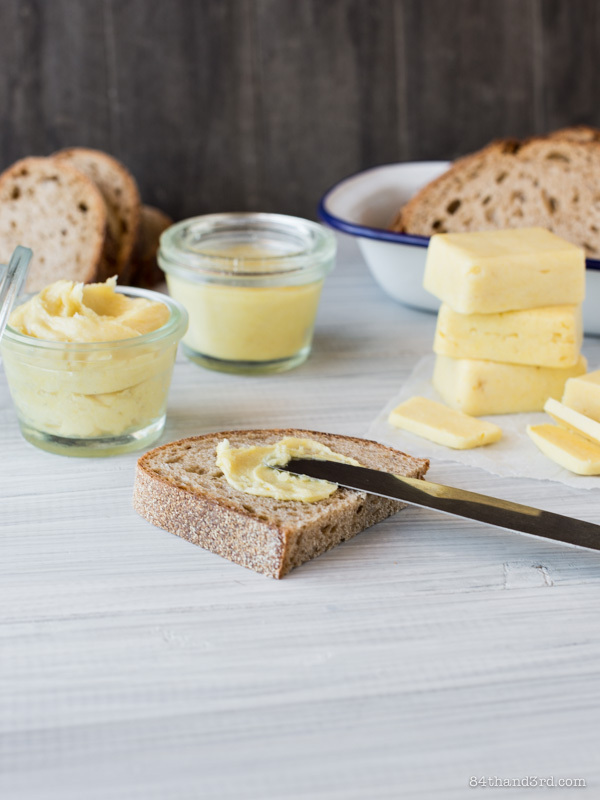 Butter straight from the fridge will crumble when you cut it but melts on contact with hot toast — for instantly spreadable butter like in the video allow to sit at room temperature for 10 mins before slicing or scooping. Nutritional Yeast : it will seem that 1 tsp water isn’t enough for 1 Tbsp yeast however you want a very thick paste, not a thin liquid. Knead water and yeast together with a spoon or the tip of a butter knife until dissolved. If you must add more water do it a tiny drop at a time. Coconut Oil : the consistency should be solid but soft, and no softer than gooey or it will not combine with the yeast paste. If it’s quite soft after making the butter you can whip it every 15 mins or so as it cools in the fridge and before you spoon it into moulds. To quickly and evenly soften Coconut Oil press it through a mesh strainer — I even made a video of it. Sea Salt: the salt added to the yeast mixture will dissolve, the salt added to the butter will retain its crystals a bit more. Feel free to add more or less to taste. You’re a genius JJ. A genius! Very clever. Does it taste coconutty at all? And do either of the two coconut oils you use NOT taste of coconut? It’s a flavour I really, really, really dislike. I love, love, love butter, but will give this a go. 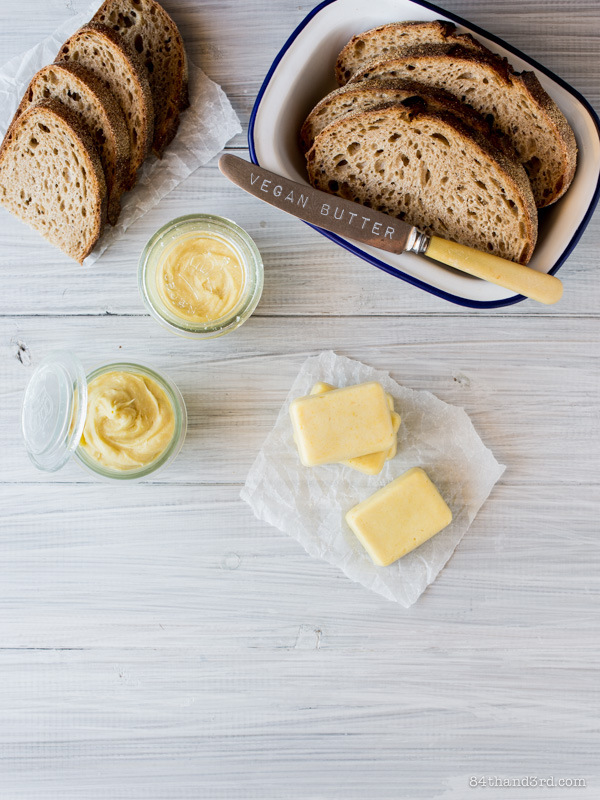 I’m not a vegan but would love to try that butter!! I’ve never bought any coconut oil, so just wondering, does this taste coconutty? I love coconut flavour! What taste does the Nutritional Yeast add? Thanks! Very interesting recipe JJ, do love your mad scientist experiments. Aha so that’s the secret! Have been curious ever since I saw your IG pic! I’ve used nutritional yeast in the past to make cashew cheese and it was delicious. Never thought of mixing it with coconut oil to make vegan butter. I would think using unrefined coconut oil will make it taste more coconutty than buttery though. I might try this using refined coconut oil since it’s more neutral in flavour – refined coconut oil is not bad, just that it has less phytonutrients than unrefined coconut oil but it still have the same amount of beneficial fatty acids. Love your mad-science approach to cooking. I do that too! It’s great when the experiment works. Eureka! Hello! I’ve made 2 batches over the past few days and: YUM! Thank you so much. I added fresh crushed garlic to the second batch. Highly recommended. As you said, the consistency of the coconut oil is important….too liquid and it won’t combine with the yeast paste. Sticking it in the fridge for 30 mins helped a lot. Absolutely delicious! I followed your recipe with no alterations and it worked out perfectly, thank so much! Absolutely delicious! I followed your recipe with no alterations and it worked out perfectly, thanks so much!